Definition at line 28 of file CNormalGeneralPower.h. Definition at line 31 of file CNormalGeneralPower.h. Definition at line 34 of file CNormalGeneralPower.cpp. Referenced by copy(), createUnitGeneralPower(), and multiply(). Definition at line 37 of file CNormalGeneralPower.cpp. Definition at line 40 of file CNormalGeneralPower.cpp. Definition at line 265 of file CNormalGeneralPower.cpp. References CNormalFraction::checkIsOne(), CNormalFraction::checkIsZero(), mpLeft, and mpRight. Referenced by CNormalSum::checkIsOne(), multiply(), CNormalSum::simplify(), and CNormalProduct::simplify(). Definition at line 176 of file CNormalGeneralPower.cpp. Returns a general power that is (1/1)^(1/1). It creates a new general power of type power and sets the left and right side to a unit fraction. Definition at line 273 of file CNormalGeneralPower.cpp. References CNormalGeneralPower(), CNormalFraction::createUnitFraction(), mpLeft, mpRight, POWER, and setType(). Definition at line 92 of file CNormalGeneralPower.cpp. Referenced by convertToCEvaluationNode(), CNormalProduct::getDenominator(), normalize_variable_names(), operator=(), CNormalProduct::setDenominatorsOne(), and CNormalSum::simplify(). Definition at line 97 of file CNormalGeneralPower.cpp. Definition at line 108 of file CNormalGeneralPower.cpp. Referenced by convertToCEvaluationNode(), normalize_variable_names(), operator=(), and CNormalSum::simplify(). Definition at line 113 of file CNormalGeneralPower.cpp. Definition at line 124 of file CNormalGeneralPower.cpp. Referenced by convertToCEvaluationNode(), CNormalProduct::getDenominator(), operator=(), and CNormalProduct::setDenominatorsOne(). Definition at line 181 of file CNormalGeneralPower.cpp. 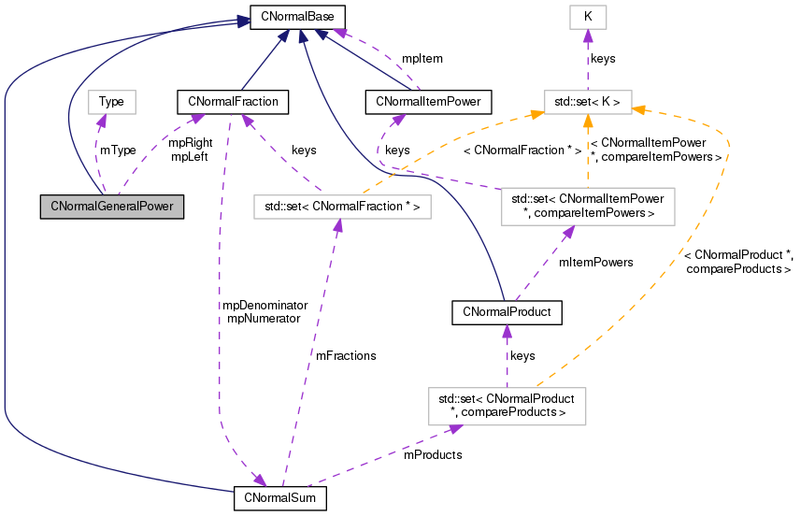 References checkIsOne(), CNormalSum::checkIsOne(), CNormalGeneralPower(), CNormalFraction::createUnitFraction(), CNormalFraction::getDenominator(), CNormalFraction::getNumerator(), CNormalSum::getProducts(), mpLeft, mpRight, CNormalProduct::multiply(), POWER, setLeft(), CNormalFraction::setNumerator(), setRight(), and setType(). Referenced by CNormalProduct::getDenominator(), and CNormalProduct::simplify(). Definition at line 145 of file CNormalGeneralPower.cpp. References mpLeft, mpRight, and mType. Definition at line 46 of file CNormalGeneralPower.cpp. References getLeft(), getRight(), getType(), mpLeft, mpRight, and mType. Definition at line 140 of file CNormalGeneralPower.cpp. Definition at line 102 of file CNormalGeneralPower.cpp. Referenced by createGeneralPower(), CNormalProduct::getDenominator(), multiply(), CNormalSum::simplify(), and test_simplify::test_simplify_1(). Definition at line 118 of file CNormalGeneralPower.cpp. Referenced by createGeneralPower(), CNormalProduct::getDenominator(), multiply(), and test_simplify::test_simplify_1(). Definition at line 129 of file CNormalGeneralPower.cpp. Referenced by createGeneralPower(), createUnitGeneralPower(), CNormalProduct::getDenominator(), multiply(), and test_simplify::test_simplify_1(). Definition at line 166 of file CNormalGeneralPower.cpp. References mpLeft, mpRight, and CNormalFraction::simplify(). Definition at line 56 of file CNormalGeneralPower.cpp. References CNormalFraction::checkDenominatorOne(), CNormalSum::checkIsOne(), CNormalFraction::getDenominator(), CNormalFraction::getNumerator(), INVALID, mpLeft, mpRight, mType, and SYMBOLS. Definition at line 40 of file CNormalGeneralPower.h. Referenced by checkIsOne(), createUnitGeneralPower(), getLeft(), multiply(), operator<(), operator=(), operator==(), setLeft(), simplify(), toString(), and ~CNormalGeneralPower(). Definition at line 41 of file CNormalGeneralPower.h. Referenced by checkIsOne(), createUnitGeneralPower(), getRight(), multiply(), operator<(), operator=(), operator==(), setRight(), simplify(), toString(), and ~CNormalGeneralPower(). Definition at line 39 of file CNormalGeneralPower.h. Definition at line 43 of file CNormalGeneralPower.h.